I don’t go on a cruise for the sake of cruising. I don't particularly care about the accommodation on the ship, the show, and the food - the buffet and the supposedly chef's signature dishes prepared for hundreds and hundreds of passengers. I go on a cruise to visit incredible destinations that are not easily accessible by land like Tasmania and Milford Sound or relatively untouched places like Antarctica. Unfortunately, I had been on a cruise where I was not able to reach the two top places in my list of destinations because Mother Nature struck her fury that our ship had to skip a port of call. On a recent cruise to the Baltic, the same thing happened. We skipped two ports of call due to fierce winds. Thankfully, I had a chance to discover Germany's charming medieval towns in the former East Germany (GDR), a place I have not been before, or the cruise to the Baltic would have left me all totally disappointed. To be honest, I was not excited about Warnemunde, Germany, our first port of call. Warnemunde is a very small port town that I could see the whole town and the Baltic Sea from the ship’s veranda. We were made aware that there's not much to do in this port town. It has a few tourist sites: the historic lighthouse, the Teepot (teapot) with curved roofs - an example of East German architecture - the der Alte Strom (Old Canal), and fishermen’s houses that were converted into stores and restaurants. It also has the broadest sandy beach in the Baltic. One of the excursions offered from Warnemunde was a trip to Berlin, a three-hour train ride to Berlin and approximately 6 hours to explore the city. Since six hours are not enough time for me to explore a cosmopolitan city with many museums and historical landmarks. I decided to visit other places closer to the port. I joined the walking tour to Wismar, a Hanseatic city in the state of Mecklenburg-Vorpommern and listed as a UNESCO World Heritage site. We left Warnemunde early in the morning. Beyond the outskirts of Warnemunde, the scenery seemed like any other I saw in my previous travels to the Western part of Germany - railroad tracks, wide roads leading to an expressway - except for the drab apartment buildings. Our guide to Wismar mentioned something about the blocks of Soviet-style apartment buildings as living reminder of the former East Germany (GDR) occupied by the USSR after World War II. The bus ride to Wismar took about an hour. We arrived in Wismar to a very pleasant day – not cold, not warm - perfect for a walking tour. We walked for three long blocks past relatively new buildings - 19th century Romanesque renovated and art nouveau apartment buildings - until we reached the town’s market square, where I saw a row of elegant buildings that looked like a façade. Our guide pointed to the brown brick building and said, "If you looked closer you'll notice that it's not a facade. It's a patrician house called the Alter Schwede, built around the 13th century, a unique representation of the Hanseatic style.” He talked about the different architecture-styles from the 13th – 14th century patrician gable houses to 19th century Romanesque renovated buildings surrounding the market square. A water fountain (Wasserkunst), an elaborate wrought iron work imported from Holland was another notable structure found in the square. We left the market square to see brick-gothic style churches that escaped damage during the WWII like the St. George Church, or heavily damaged, reconstructed and still undergoing reconstruction like the church of St. Nicholas. The high tower church of St. Mary’s, a remainder of the original brick Gothic structure, dominated the city’s skyline. Our walking tour ended at another historical site or perhaps the highlight of the walking tour for some people in the group - the more than a century old beer house, Brauhaus am Lohberg - where we stopped for lunch of pretzels and different kinds of beer. I nodded on and off on the drive back to Waremunde as our coach drove through an expressway bordered by large-scale agricultural landscape. After Wismar, I took the train to Rostock to explore the city on my own. It was a 20-minute train ride from Waremunde. I studied the map of Rostock and the places to visit recommended by our ship’s location guide. As soon as I arrived in Rostock, I went to the visitor information center to ask for direction to the town center. The clerk highlighted the direction on my map, supposedly a 10-minute walk from the train station. After walking for more than ten minutes, I still found myself in a residential area, no town center in sight. I pulled the map from my bag to see if I was still on track, but the map was gone. I must have dropped it. I continued to walk intuitively towards the bay when suddenly I heard music from a distance. I followed the sound to arrive in the town center to some sort of festival. I saw young girls up on the stage, dancing to American pop music. The atmosphere was like something you would find in the US: an outdoor mall lined with popular stores like H&M and fast food restaurants like Subway, except for the Hanseatic buildings that lined the streets. I continued to walk to some random place hoping to find the Cathedral and tourist sites recommended by the ship location guide. It was late in the afternoon when I returned to Wundermunde. I had less than two hours to explore the port town before returning to the ship. But 1 ½ hour was plenty enough to spend in the small port town. I had time to sit down for coffee and gelato and dinner before returning to the ship. I visited the lighthouse, and some shops and restaurants at the Teepot or Teapot, and went to fisherman’s house that was converted into a restaurant where I tried the local fish sandwich. I strolled along the der Alte Strom (Old Canal), lined with restaurants and pubs and colorful fishing boats. The place was crowded. A lot of people like me who just returned from their offshore excursions or those who stayed to laze on the broad sandy beach of Waremunde, getting ready to embark on the cruise ships. By the way, there were two other cruise ships docked in the port. Kiel Germany was another port of call after Russia, Finland and Sweden. We arrived in Kiel in the middle of the sailing regalia, said to be the biggest sailing event in Europe if not in the world. The city streets turned into an amusement park with outdoor cafes and pubs, and entertainment. After the mugging incident in Stockholm, I decided not to go exploring a place on my own and to avoid the crowd. I signed up for the offshore excursion to Lubeck, another Hanseatic League city and a UNESCO World Heritage site and famous as the birthplace of marzipan. It was about 45 minutes bus ride from Kiel. A very athletic looking middle-aged man, wearing a tight sporty shirt met us to lead our walking tour of the medieval city. 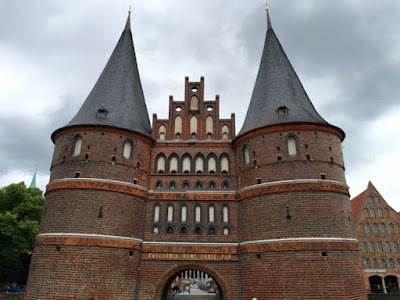 We did not go through the most famous landmark, the Holstentor Gate, to start our walking tour, but our bus dropped us off at the northern end of the city. We started our walking tour with a visit to the Hospital of the Holy Spirit to see the typical room and the ceiling of the original hospital. A stone throw away, we found St. Jacob Church with one of the most recognizable towers with four spherical globes at the helm of the tower’s edge. Our guide talked about the material composition of the tower. Directly across from the St Jacob Church we saw a patrician house with the “1535” inscription above the doorway. It houses the “Schiffergesellschaft “that doubles as a maritime museum and a restaurant. We went inside just to admire the 16th century interior decor. After a very brief visit inside the restaurant, we turned a corner and walked downhill to a narrow cobbled street lined with renovated Hanseatic architecture, and stopped at the site with ‘Backer-Gang No. 43’ sign above the low archway. It led to a very narrow passageway, considered a major thoroughfare in medieval times. 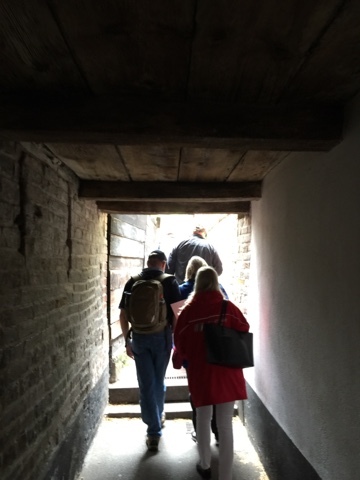 We walked through the narrow passageway while our guide continued to narrate Lubeck’s long history and about the people that inhabited the city - from the last ice age to the Neolithic, to Slavic and to the Germanic Saxons. I was busy taking pictures that I could hardly keep up listening to our guide's narration about the city’s long history and name of the rulers responsible for getting the historical buildings built. In addition, my mind started to wander off and I could not help thinking about the marzipan treats. After walking along the widest street in the city, we reached the town hall. We stopped briefly to see the house of Lubeck's famous poet, Thomas Mann. The city was celebrating some sort of festival. Bands were assembling in front of Thomas Mann's house and getting ready for a parade that our guide motioned for us to follow him and leave. 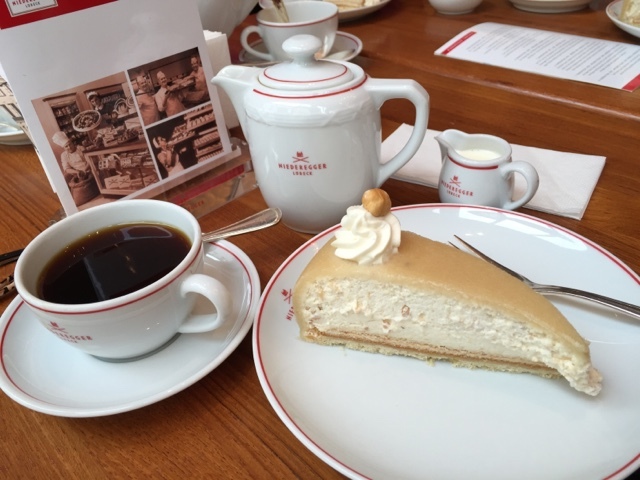 Across the town hall, I found the world famous marzipan confectioner "Niederegger" store and cafe. We stopped for coffee and a piece of marzipan heaven (cake). After the coffee break, we met up with our local guide at the town hall square to resume our walking tour. We walked under the shadow of the church tower to see more churches like the churches of St. Peter and St Catherine’s. The church towers dominated the city skyline. We passed the Museum of Theater Puppet, and visited more Hanseatic houses focusing in on the brown house that was crooked. 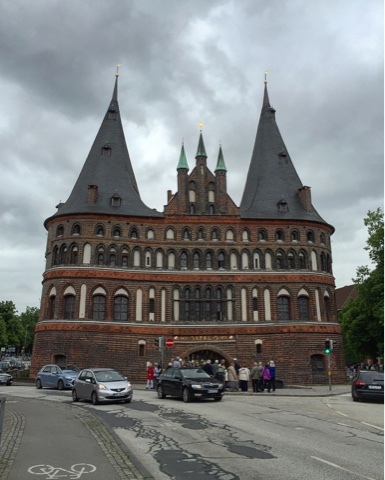 We headed down the river, crossed the bridge and finally went through the Holstentor Gate, the ultimate symbol of medieval Lubeck. And of course, we passed through it not without hearing a long narration about the history of the gate and Lubeck. Lubeck is one of the best places to do a walking tour, not only because it is small enough that you would be able to see all the highlights in less than a day, but because there is a place, where you can stop for a while and enjoy a slice of cake glazed with marzipan. And of course, I’m very biased because marzipan happens to be my favorite treat.